Our detailed countertop guides were created to help you sort through your countertop ideas and compare all types of countertops. You'll find below brief reviews of each countertop material with links to detailed countertop guides featuring unbiased, real-world critiques that illuminate the benefits and drawbacks to help you decide which kitchen countertop surface is perfect for your project. Read the key points of each surface below then click the links to go to the complete detailed guide for that countertop material. Granite countertops are the traditional favorite for kitchen countertops desired for the thousands of unique colors and patterns, proven durability, and lasting value. Granite is a natural stone that can withstand direct heat from hot pans, nearly impossible to scratch, and is stain-resistant. Most granite colors will need sealing to help prevent stains, although some varieties do not require sealing. Once sealed, a granite countertop is a low-maintenance material that is difficult to damage if you follow some simple procedures for cleaning granite countertops. Quartz countertops are an excellent man-made surface also called "engineered stone". This material is manufactured from 93% quartz (also a component of granite countertops) and a binding resin. Quartz countertops are scratch, heat, and stain-resistant and have very similar performance properties to granite. Excellent for kitchen countertops. Quartz countertops do not need sealing, however, they are not stain-proof and prolonged heat can cause damage to this type of countertop. Several companies (Silestone, Cambria, Caesarstone) offer basically the same product (material composition) with different colors and options. Quartz colors and patterns are somewhat limited compared to granite countertops, however, a full range of colors are available and the major quartz manufacturers have upgraded their color palette significantly in recent years with many beautiful choices. 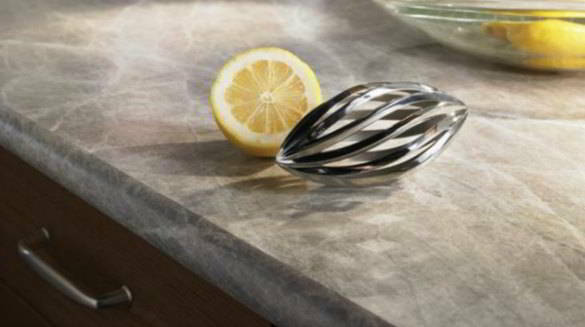 Also, many prefer the consistent nature of quartz patterns vs. the "movement" often seen in granite slabs. Quartz countertop costs are similar to granite prices as well. For a complete head to head comparison go to our Quartz vs. Granite page. 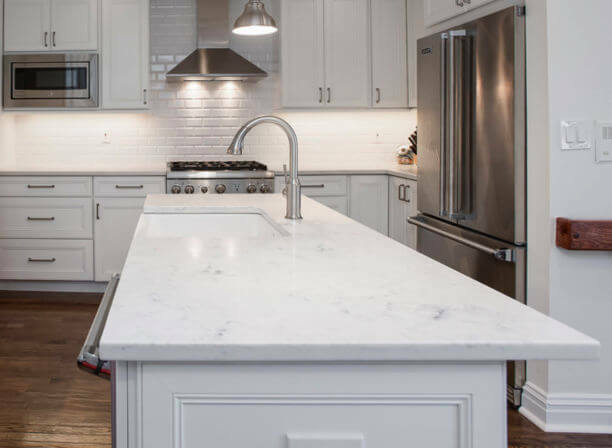 Quartzite countertops have only recently become a top choice for kitchen countertops following the rise in popularity of white and gray colors in kitchen design. Quartzite is a natural stone not to be confused with "quartz" which is a man-made countertop material. Like granite countertops, quartzite is very hard and durable, takes the heat, does not scratch and is stain-resistant (sealing is needed in most cases). The main allure of quartzite countertops are the colors and patterns that resemble marble. Many homeowners want the "look" of marble countertops without the maintenance and quartzite fits the bill. Corian Countertops are the most popular brand for this type of surface known as "solid surface countertops". 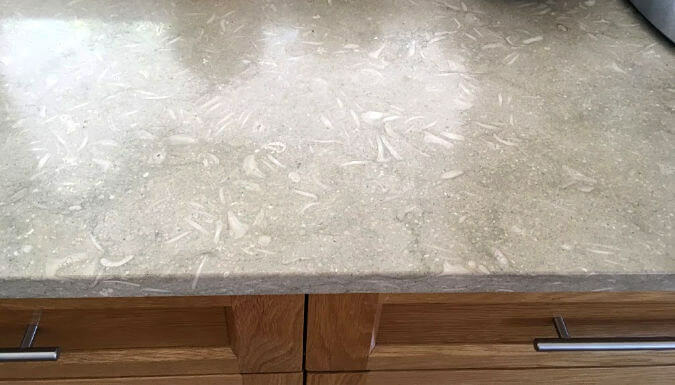 Blending acrylic polymers with stone-derived materials makes for a durable, versatile, and repairable bathroom countertop or kitchen countertop. 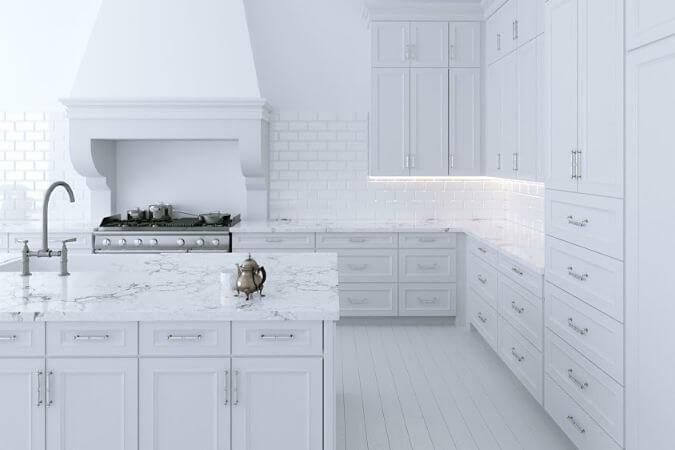 Corian and solid surface countertops resist stains pretty well, but are rather easily scratched by knives or dented by pots and pans and can be damaged by heat. The good news is that stains and scratches in Corian can be sanded or buffed away, it can be installed without visible seams, and sinks can be molded right into the surface as one piece. Color choices were once limited and conservative, but recently many attractive colors have been added reflecting natural patterns and textures with many that look like stone. See our review of Corian vs. Quartz vs. Granite for a comparison of these countertop materials in addition to the Corian countertop guide linked at the top of this section. Marble countertops are gorgeous and for many the pinnacle of luxury. White marble like Calacatta and Carrara marble are the most sought after varieties, but a full range of colors is available. Marble is softer than granite, which makes it more susceptible to scratches. However, contrary to what you may have read, most marble is not very porous and does not stain easy (though being a natural product there is variation). 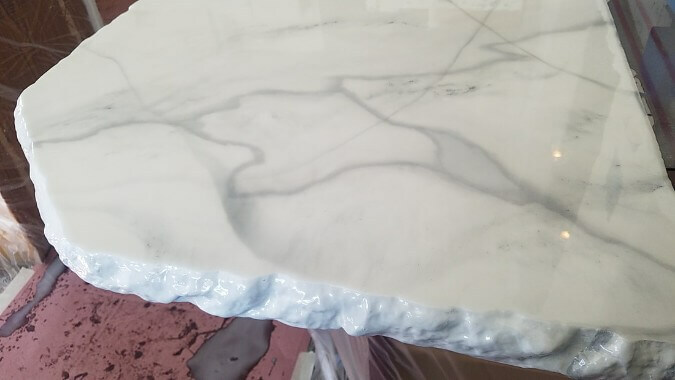 Marble countertops do etch easily though and most people mistake etching for staining So, you'll definitely want to learn more about cleaning marble and needed maintenance before installing marble particularly for kitchen countertops. Marble is far less trouble for bathroom countertops. Travertine is a sister to marble, although, with a more limited color palette primarily consisting of earth tones. Travertine has qualities and characteristics similar to marble countertops when it comes to care & cleaning. Likewise, travertine is not a top recommendation for use as kitchen countertops. 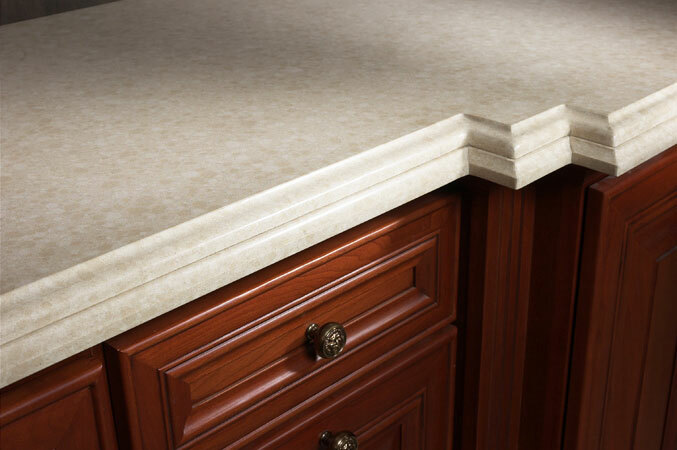 Limestone countertops fall into the same category with marble and travertine. In fact, all marble and travertine originated as limestone before going through various changes and transformations within the earth over millions of years. Unique to limestone are embedded shells and fossils that add interest to the color and pattern. Limestone is a soft stone, so it will scratch. Also, it generally cannot be polished to a high shine like marble countertops. Like marble and travertine, it is fairly dense and stain-resistant, however limestone will etch. Marble, travertine, and limestone are not good picks if you're wanting a low-maintenance kitchen countertop. But... hey, you like what you like! These natural stones are perfect and elegant for bathroom countertops, table tops, shower and floor tiles due to their excellent footing with a honed finish. 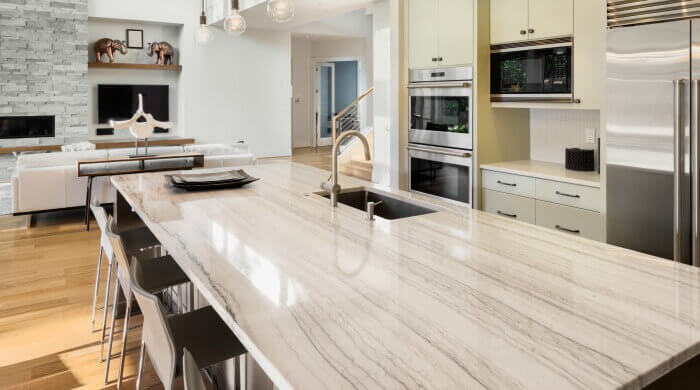 See these countertops that look like marble for an alternative choice without the extra maintenance of marble. 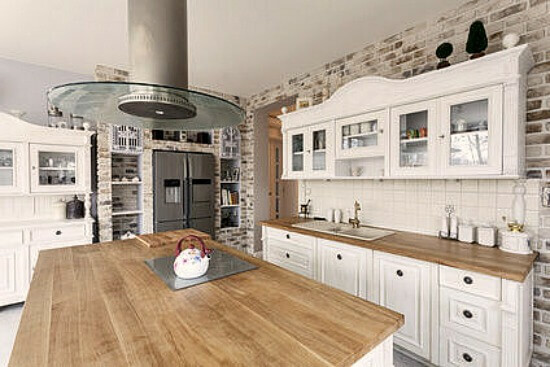 Concrete countertops can add a charming rustic or cool industrial vibe to your kitchen design. Concrete is very versatile with many style & design options not available with other types of kitchen countertops. Custom colors, patterns, shapes and curves are all possible as well as embedded objects like shells or rocks or anything you like. And DIY installation is possible if you'er looking for cheaper countertop materials. Concrete countertops can scratch, stain, crack but are fairly heat-resistant. Sealing and waxing are needed on a regular basis. Wood countertops have stood the test of time and remain a popular choice for kitchen countertops despite all the newer and in vogue countertop materials now available. The reason is that wood and butcher block countertops work well in any kitchen design. That special warmth, texture, and beauty easily compliments all other materials and styles. Wood is durable and can be repeatedly refinished if needed, but it is more susceptible to cuts, stains, and damage than most other surfaces and does require particular care and cleaning. Soapstone countertops are a durable and low-maintenance natural stone that is prized for its rustic charm and smooth-as-silk surface. 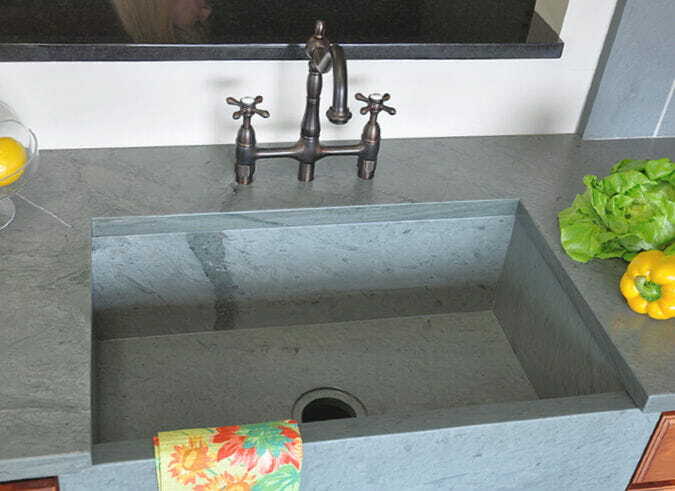 If you like the look of honed black granite or the veining of marble, then check out soapstone. Soapstone kitchen countertops can have subtle to dramatic veining or no veins at all but colors are limited to greens, milky grays, and black. Even so, the design versatility of soapstone is impressive. It's perfect for a country kitchen, but can also look stunning in classic black and white or modern minimalist kitchens. Soapstone will darken with use and exposure to foods and oils. 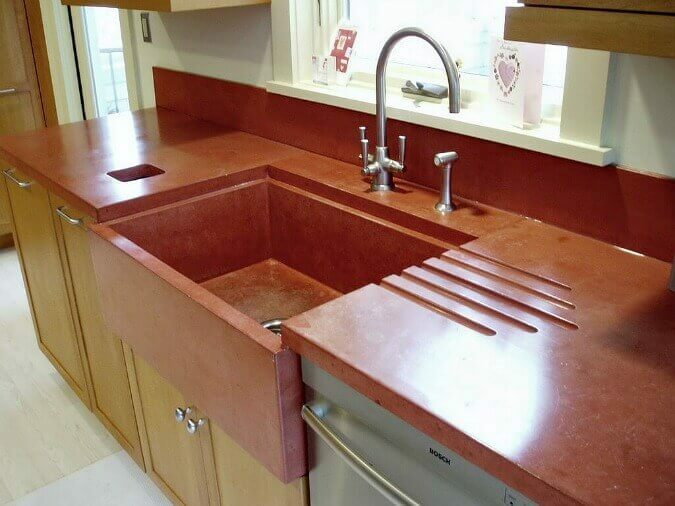 Thus, soapstone countertops are usually oiled to achieve an even color. Soapstone doesn't stain or etch from acids, doesn't need sealing, and hot pots don't bother it at all. However, it is soft and can scratch, but scratches can be sanded and repaired with relative ease. DIY installation is also possible as soapstone is softer and far easier to cut and install than granite countertops. Slate countertops have a look and color palette similar to soapstone (greens, grays, and blacks) but also shades of red, purple, and gold. Slate countertops are a popular choice for rustic kitchen countertops or to warm up a traditional design. Some slate slabs will have veins but most are a solid color. Slate is hard and highly-resistant to heat and stains, but it is brittle so can chip and scratch. Also, some slabs will etch from acidic foods. The quality of slate can vary quite a bit along with it's durability so a careful choice of slabs is paramount. Many like slate for it's unique cleft or cascading texture, although, this type of finish can make cleaning and repairs more difficult. 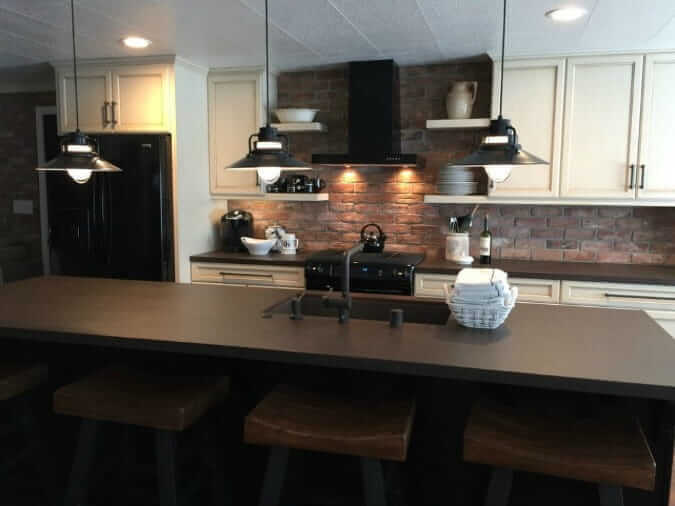 Metal countertops are not often considered for a kitchen countertop material, but have a distinctive look and feel with an old-world charm that blends well with many other design materials like stone, glass, or wood. 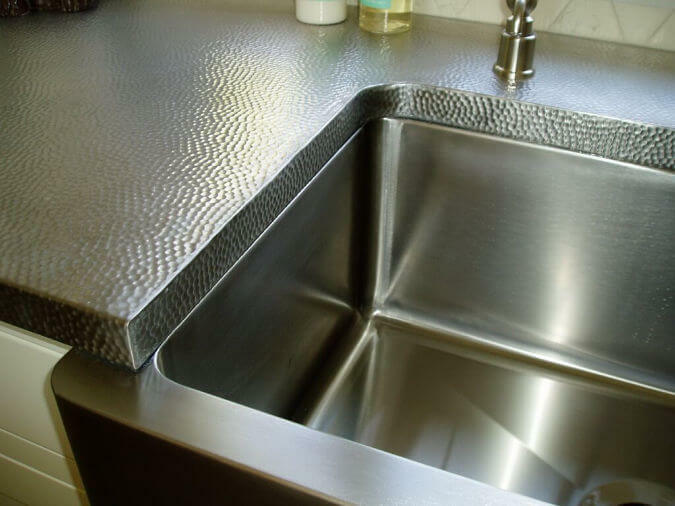 Metal countertops can be fashioned from several different metals like copper, pewter, bronze, zinc, brass and stainless steel and are highly customized with interesting surface textures, creative edge profiles, unique design elements like rivets, and matching or integrated sinks. The cool thing about metal is that you can keep the surface looking new and shiny or let it patina with age which really adds a warm richness to your kitchen design. 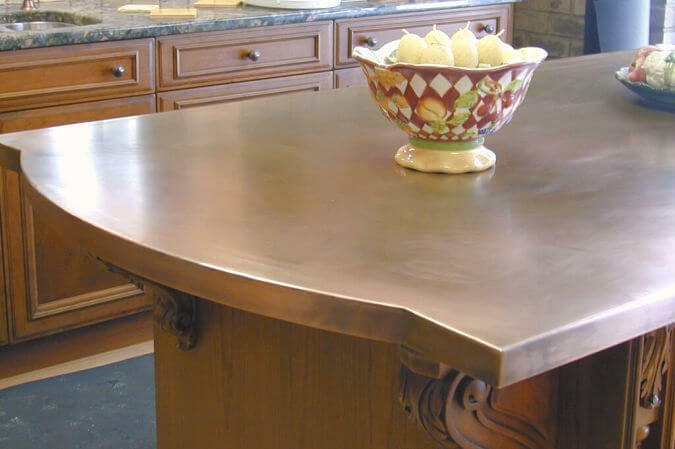 Metal countertops do require some specific maintenance depending on the look you're going for and can be etched by acids but this can be part of the aging process. Otherwise, metal is easy enough to clean on a daily basis. Stainless steel countertops are the most popular and well-known form of metal countertops sharing most of the distinctive features, pros and cons of metal. Durable and easy to clean, stainless steel is the top choice for the industrial look of a professional kitchen. However, scratches, dents, and fingerprints are an issue. Also, it is rather cold and can be noisy. On the plus side, metal and stainless steel counters can be installed without seams in most cases. Buying prefabricated stainless steel countertops will save a bundle as custom design and installation can be expensive. Laminate countertops have improved a lot in the last decade with many new color options as well as more customized edge treatments. Laminate kitchen countertops are pretty durable. Laminate doesn't handle heat too well, can scratch and chip, but generally this countertop material holds up under normal use with reasonable care. Daily cleaning is a breeze. Of course, it won't compete with granite or quartz countertops on resale value, but laminate has stood the test of time and definitely gives the most bang for the buck of any countertop material. Glass countertops have gained popularity and are a great pick for those looking to add unconventional flair to their kitchen design. Custom shapes, colors, embedded objects and designs, unique or one-of-a-kind textures, and backlighting are all possible with glass. Glass countertops come in a few varieties: solid clear glass, white glass, and recycled glass composite. 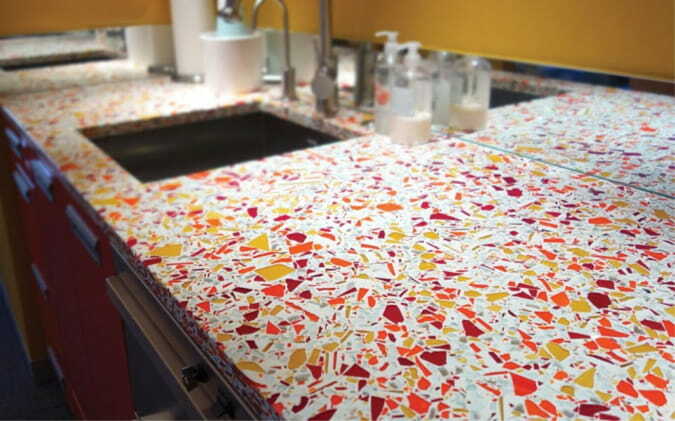 Glass kitchen countertops are heat tolerant, stain-resistant and don't need to be sealed. However, clear and recycled glass surfaces can etch from acids. White glass is not bothered by acids, though, and is super as an outdoor kitchen countertop. Glass counters can be quite spendy to fabricate and install compared to other types of countertops depending on how "custom" you want to go with design details. Recycled glass is the most economical but still not cheap with prices similar to granite countertop costs. Recycled Glass Countertops are a fresh, playful and more eco-friendly alternative to the common granite or quartz countertops. This surface is made with shards of glass set in a cement or resin-based material to create a colorful mosaic. The size and mix of glass pieces can be customized and pigments can also be added to the base so any color is possible. 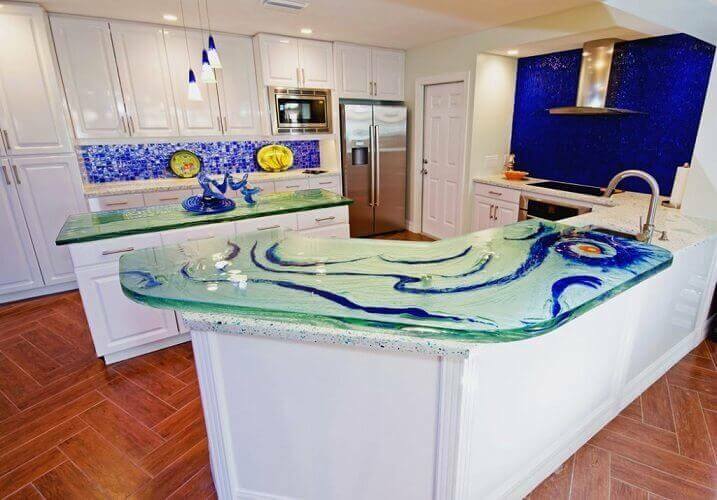 Recycled glass countertops are reasonably durable and easy-to-clean, but do have some drawbacks and particular care is needed. Cement-based surfaces will etch from acidic foods and drinks and also must be sealed to prevent stains. Those made with resin can be discolored by certain household chemicals. Limited availability makes finding and installing recycled glass more challenging and they aren't cheap either. Prices can be as much or more than granite or quartz. Porcelain countertops are a fairly new option but increasing in popularity with basically the same benefits that have made porcelain tile so favored. Porcelain kitchen countertops are made from clay fired at extreme temperatures that results in a super hard and dense surface with superior durability. Porcelain is heat, scratch, and stain-resistant. Really it is nearly impervious to any damage. However, forceful impact can cause chips and cracks, but this is rare. Edges are the most vulnerable. Many colors and patterns are available with some that look like Carrara marble. Dekton countertops along with Neolith countertops are a new breed of kitchen countertops classified as "ultra compact surfaces". These are a lot like porcelain and are sometimes confused as such, but ultra-compact surfaces have qualities of glass and quartz countertops. The result is a super-tough surface that won't burn, stain, etch, or scratch (except from ceramic knives). It doesn't need sealing or any special cleaning routines. On this front it is perhaps the most durable surface on the market currently. It's weakness is a tendency to crack or chip when heavy objects like a fumbled plate or pot impacts the surface. Edges are particularly vulnerable. Also, Dekton and Neolith are not in large supply and require skilled fabricators and installers experienced with handling this countertop material. Epoxy countertops are a new fad in a way. 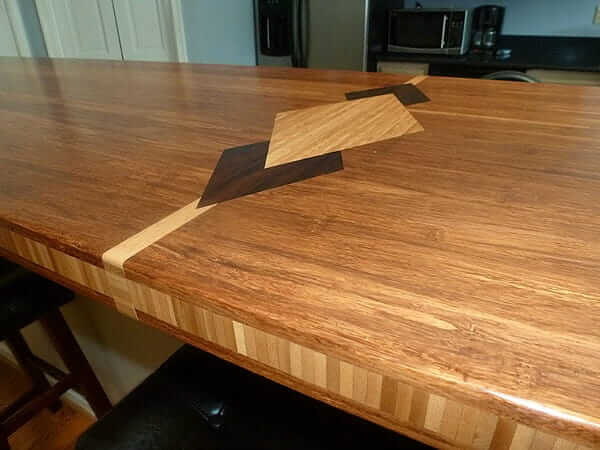 Applying a clear coating of epoxy over wood countertops and other surfaces has been going on for a long time but creating custom colors and patterns using epoxy is a rising DIY trend. Epoxy countertops are a great discount countertop option and that is the biggest selling point... low cost. However, it's a complicated and messy process to apply epoxy. Also, you may need a bit of experience working with the material to make an artful and pleasing design. But designs can look absolutely amazing. As a countertop material it is reasonably durable, easy-to-clean, and very glossy. First, consider the disadvantages of installation and then decide if the low cost is worth it. Bamboo countertops are an eco-friendly option made from grass (a renewable resource) but have the look and feel of a wood countertop. Bamboo kitchen countertops are warm and stylish with an attractive gold or caramel color and several different grain options including butcher block. Bamboo is hard, durable and easy to refinish if damaged. The problem is that it is easily damaged. Bamboo countertops can be burned by hot pans, stained, scratched and warped from water exposure. Sealing is required. Still, if you learn proper care protocols bamboo can look good and last a long time like a typical wood or butcher block countertop.